The Fujitsu LifeBook S761 is a 13.3in laptop that weighs only 1.7kg, yet it has a powerful configuration and a lot of features in its robust chassis — including a DVD burner. Being a business-oriented model, it also has lots of security features, some of which work well, some of which may require the help of Fujitsu's tech support set up. It's definitely a laptop that has a lot going for it and we think it's up there with the Toshiba Portege R830 as far as all-round, mobile laptops are concerned, but it is expensive. For $2588, you get a laptop that runs an Intel Core i7-2620 CPU, 8GB of DDR3 SDRAM and a 500GB, 7200rpm hard drive. The CPU is one of Intel's mid-voltage parts: it has two cores, Hyper-Threading and it runs at 2.7GHz. It's a powerful configuration for a small laptop and it supplies lots of grunt for office and multimedia work, but we can't help thinking that it should ship with a 128GB solid state drive for the price (although the maximum amount of RAM has inflated that price a little). In our Blender 3D rendering test, it recorded a time of 37sec, while in the iTunes MP3 encoding test it recorded a time of 46sec. These times are not super-fast — its Blender time is what we expected (compared to the Dell XPS 15z, which uses the same CPU) but it's barely faster than the time recorded by the Portege R830 which we tested with a 2.5GHz Intel Core i5-2520M CPU. The Portege R830 even performed better in our DVD transcoding test: the Fujitsu took 49min to convert our DVD file to a 1.5GB Xvid file, while the Toshiba took 48min. The Fujitsu should have been faster when we look at the result that the Dell XPS 15z obtained (44min) and this perhaps has something to do with all the background programs that are installed on the Fujitsu — there are so many take up half the length of the Taskbar. From these performance results we can see there is not much advantage to having the Core i7 over the Core i5 when running office apps. However, the Core i7 has better integrated graphics. This was shown in 3DMark06, in which the Fujitsu recorded a score of 5014. The Portege recorded 3792 in the same test, so you can see that the Fujitsu is superior when it comes to processing 3D graphics. As for battery life, the S761 ships with a 6-cell, 67 Watt-hour battery that lasted 4hr 8min in our rundown test. In this test, we disable power management, enable Wi-Fi, maximise screen brightness and loop an Xvid-encoded video until the laptop runs out of juice. Our result isn't too far off Fujitsu's claim of five hours, and there is a battery utility that can help you manage the LifeBook's consumption so that it can indeed get close to or even over five hours of life. When using the laptop for basic Web browsing and documents creation, and with a low screen brightness, you should get even more out of it. It's worth noting that the LifeBook S761 has a very bright matte screen (rated at 300 nits) with 12 brightness levels. It looks vibrant and it's great for viewing photos and videos. It's a thin screen that has a magnesium alloy cover and it flexed quite a lot in our tests, but much like the Portege, this behaviour is by design. Overall, this notebook feels strongly built, despite its light weight. The mag-alloy chassis is tough and not sealed. 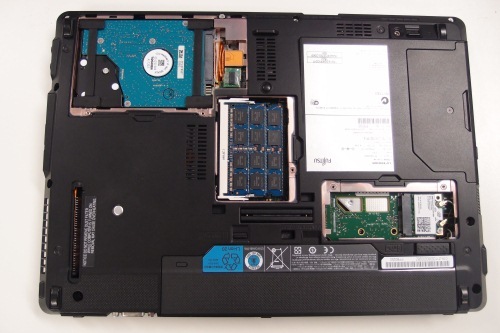 It has many panels that can be removed for servicing the laptop. You can easily get to the wireless module, twin memory slots and the hard drive. There is protection for the hard drive in the form of some chassis reinforcement under the palmrest, rubber dampers on the corners of the drive, and a motion sensor is also installed, which only parked the drive's heads when we forcibly knocked or dropped the laptop onto the desk. 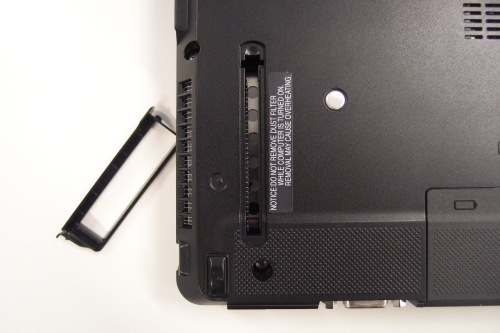 The chassis has easily removable panels for replacing the hard drive, RAM and Wi-Fi module. The LifeBook's hard drive bay. The laptop runs fairly cool overall, even when used in a lap for a while, and we don't foresee overheating as being an issue, unless the air outlet is blocked. There is a heat sink and fan on the left side of the chassis and there is a little module that can be removed so that lint and dust can be cleared from between the heat sink's fins. A removable module allows the heat sink to be cleaned from the inside out.